Google is one of ConnectAmericas’ anchor partners and an active promoter of multiple initiatives worldwide to reduce the digital gap and promote the growth and competitiveness of women-led businesses. Google supported ConnectAmericas for Women’s launch in May 2016, and now joins the IDB´s #100kChallenge to strengthen the digital and entrepreneurial skills of women entrepreneurs all over the Americas. Google will participate in face-to-face and virtual training workshops specifically designed to train female entrepreneurs in the use of digital tools, facilitate the participation of prominent Googlers to share their experiences and success stories, and offer tailored advice to women entrepreneurs in order for them to take advantage of innovative tools like Digital Garage and Google My Business. IBM is collaborating with the IDB´s 100kChallenge to accelerate innovation and business generation by enabling women entrepreneurs in Latin America and the Caribbean with technologies, knowledge, and capabilities geared at accelerating their business curve, innovating, and applying modern and agile methodologies to think at large, start small, and move fast. IBM is contributing to the program through 2 concrete initiatives: credits varying from US$ 12,000 to US$ 120,000 per woman entrepreneur for the use of services applications in the IBM Cloud trough the IBM Global Entrepreneur Program (GEP) and by training women with soft and hard skills through Agile webinars as well as Virtual Design Thinking Mentoring sessions, which are specially designed towards this program and aims to enable them to accelerate new business model solutions in the region. For over 100 years, IBM has engaged at large with the business community. One of IBM’s strategic imperatives is to create the social infrastructure necessary for women and other under-represented groups to access education and other resources that they need to fully reach their potential. This year, IBM was honored with the prestigious 2018 Catalyst Award for their leadership in building a workplace that values diversity and inclusion. Microsoft's mission is to empower every individual and organization on the planet to achieve more. The fulfillment of this mission requires a permanent state of innovation, through which we develop solutions to new problems that arise daily. Entrepreneurship is an agent of change and innovation, and women entrepreneurs are key to the region’s development and. We are proud to work with the IDB and ConnectAmericas for Women to continue supporting women entrepreneurs in Latin America and the Caribbean, as well as the digital transformation needed to build a region with greater potential. Firstly, Microsoft will be supporting the #100KChallenge initiative by facilitating women entrepreneurs’ access to our most successful educational platforms such as Yo Puedo Programar, Yo Puedo Emprender, Microsoft Virtual Academy (training and online courses), and Microsoft for Startups (through which we are committing US $500M over the next two years to support entrepreneurship globally), among others. Secondly, by bringing Microsoft experts together to conduct online and in-person workshops to promote the digital transformation of women-led businesses in the region. Thirdly, by allowing Microsoft role models to participate and share their experiences and mentor technology-based entrepreneurs. Lastly, Microsoft will be recognizing the achievements of Latin American technology-based entrepreneurs in events and through social media. Technology creates opportunities and we must prepare people in Latin America and the Caribbean to take advantage of them. In recent years, Facebook has offered training in digital marketing to thousands of women entrepreneurs in Latin America and the Caribbean through programs such as Impulsa tu Empresa or #EllaHaceHistoria. Facebook will continue working with the Inter-American Development Bank on ConnectAmericas and by supporting the #100kChallenge initiative to pass these opportunities to more women throughout the region by means of different training formats, such as webinars and face-to-face workshops. 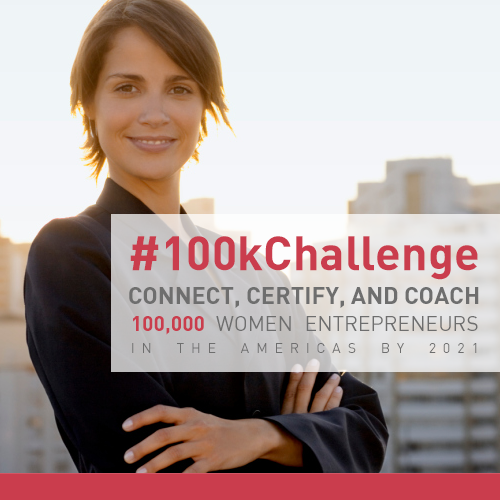 Coca-Cola is proud to support the #100kChallenge and to work with the IDB and ConnectAmericas for Women to strengthen capabilities, skills, and competitiveness of women-led businesses in Latin America and the Caribbean by helping them increase their participation in higher-demanding global value chains. Coca-Cola recognizes that women are a key engine of growth in the 21st century, which inspires their global initiatives to promote women’s economic empowerment. Coca-Cola’s strategy to empower and further include women focuses on three aspects: i) people, to promote women leadership and achieve a 50/50 workforce by 2020, ii) market, with their 5by20 initiative to support economic development of five million women in their value chain by 2020, and iii) community, by promoting education and empowerment programs for girls and women through The Coca-Cola Foundation. PepsiCo joins the IDB’s #100kChallenge to contribute to the empowerment of 100,000 women in the Americas by 2021. PepsiCo, through its Women with Purpose initiative, will work hand in hand with ConnectAmericas for Women to strengthen the business skills of women entrepreneurs in the region and facilitate their access to business opportunities. PepsiCo is guided by Performance with Purpose, its fundamental belief that the success of the company is intrinsically linked to the sustainability of the world around it. The Performance with Purpose agenda is focused on continually improving the products they sell, protecting the planet and empowering people around the world. In 2016, PepsiCo launched the Women with Purpose program in partnership with FUNDES. The program is focused on empowering women to include them into value chains through employment and entrepreneurship opportunities. Mastercard is a partner of IDB since 2014 as a donor for the Transparency Fund. Most recently, Mastercard and IDB have strengthened its relationship to develop initiatives in different work streams focused on promoting trade, transparency and economic development in the region. Since 2017, Mastercard has been working to incorporate electronic payments capabilities and tools to the ConnectAmericas platform, as a way to allow thousands of entrepreneurs to take advantage of the digital transformation and globalization. Now, Mastercard is supporting the launch of #100kChallenge to work jointly with ConnectAmericas for Women, in order to develop and strengthen women entrepreneurs, providing insights and sharing innovative ideas to address challenges and opportunities faced by them, especially in accessing digital financial services, as well as key business advice for their businesses growth and success. DANPER is an agro-industrial company with operations throughout the Peruvian territory. It is a leading company in the production and export of vegetables, fruit, and other specialties for the most demanding markets. DANPER has been a client of the IDB Group since 2014, and thanks to the support received from the Bank, it has obtained international certification in gender equality. Danper is the first company in Peru and the first agro-industrial company in Latin America to obtain the EDGE certification. This certification confirms and validates DANPER’s commitment to create development opportunities –on equal conditions- for both women and men who add value to its operations. Now, DANPER joins the #100kChallenge with the permanent commitment to extend its inclusion policies to its corporate purchasing polices and practices. DANPER will publish purchasing announcements on the ConnectAmericas for Women platform. These will be exclusively for women-led businesses in traditional and non-traditional sectors such as infrastructure and its aim is to integrate a greater number of these companies into its global supply chain and to diversify their supplier base.